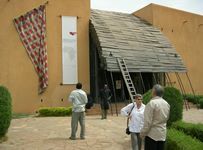 BAMAKO SYMPOSIUM 2012 will bring together artists, theorists and cultural entrepreneurs from around the world to interact and exchange dialogues on the useful and non-useful impacts of media arts on the global marketplace of ideas. The symposium series reckons a major issue in Africa’s development is sustainability. Through the years, many developmental initiatives have continued to emerged, but failed to roll out and be sustained. With the practical acts and theoretical presentations, we aim to promote critical dialogues on the best practices around the world on how the media arts feed civilizations. Along these lines, the symposium asks: How are the media arts worldwide feeding civilizations? What are the implications for tapping the abundant local resources in Mali in the 21st century? Interested individuals and collaborative groups should apply by submitting the abstract of your proposed paper or practical act (200 words maximum) in English or French with a brief biography (200 words maximum) of the presenter to Kadiatou DEMBELE at dembele_kadi2000@yahoo.fr, and copy the e-mail to balanise@yahoo.fr and info@nkafoundation.org. The submitter should include title of the contribution and author(s) information such as name, affiliation, address, phone contact, and e-mail. Upon acceptance, author(s) can decide to publish the full text or only the abstract in symposium proceedings. Abstract deadline is May 2 and submissions will be accepted until space is filled. The deadline for the full text submission is July 2, 2012. If submitting full paper (6,000 words maximum in APA format).